Hey all. I’m Nike from [DnT] and this is my guide for the updated warrior build for dungeon speed runs with organized groups. Since the feature patch in April, our theorycraft sophistication has improved significantly. The most important change was our understanding of the importance of Vulnerability stacking to overall team DPS: while we always understood that maxing out Vulnerability at 25 stacks was the important, our previous analysis always determined the optimal DPS build assuming 25 Vulnerability as a given, however; there are almost no non-Engineer team comps that can permanently maintain 25 Vulnerability against boss mobs. This means that almost every team comp will be chronically short of Vulnerability, and the longer the fight the more short of Vulnerability they will be. As a result, the optimal build in most cases is not the build that has the best DPS at 25 Vulnerability, it is the build that has the best DPS while maximizing Vulnerability. For example, if Build A gets 12,000 DPS and makes 3 stacks of Vulnerability, it is less optimal than a build that makes only 11,750 DPS but provides 6 Vulnerability stacks, assuming your party would make use of the 3 additional stacks. And as I said, almost every party would make use of those extra stacks. 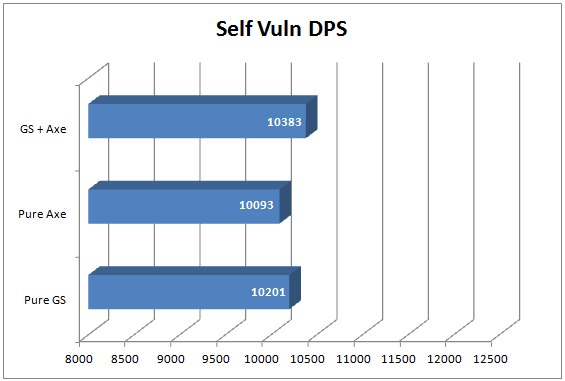 For us, we have found it most useful to calculate DPS without any vulnerability considered, except the Vulnerability that the build itself can provide. This Vulnerability Adjusted DPS paints a significantly more accurate picture of what the builds are doing in game. This revised analysis has led us to abandon some previously held beliefs and to arrive at very different conclusions. Unlike Might, Banners and Fury, Vulnerability is difficult to cap, and even more difficult to maintain at the cap. The other team buffs are trivial and can be taken for granted in any semi-organized team. Vulnerability cannot be. All DPS numbers referenced in the remainder of this guide assume banners, Might and Fury for givens. It only assumes Empowered Allies for Empowered Allies builds for reasons we will discuss further in. Our second conclusion is that Empower Allies itself is only marginally useful. 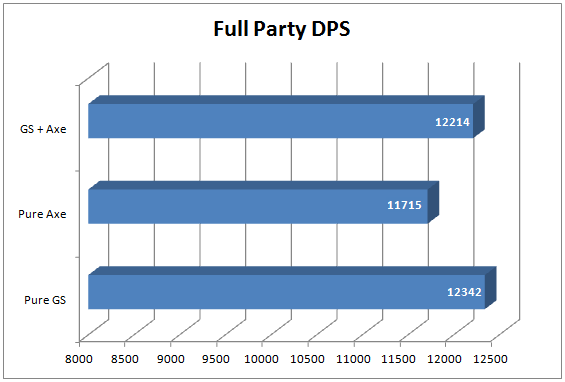 In very rough terms, an EA build makes roughly 1500 DPS less than a true DPS warrior. But EA buffs his team, under optimal conditions, by about 2000 DPS. This net gain for the party is very small, and suboptimal parties won’t net any gain at all. As a result of this analysis, we can only recommend Empower Allies builds for groups that are trying to min/max perfectly; which would be for speed run records or boss kill time records. We do not feel an EA build is appropriate for casual runs or pick up groups. Based on our conclusions, there are two optimal Warrior builds, and 3 other close to optimal build that have imperfections. I will briefly discuss all 5 before going into detail individually. The Main Warrior build is a DPS build focusing on providing maximal personal DPS while also contributing excellent amounts of Vulnerability stacks. This is a versatile build that operates well in organized groups and pugs. The theoretical max DPS is below the Pure Greatsword build, but it provides significantly more Vulnerability so for almost any group it will provide the overall highest team DPS. The second build is a Pure Axe Empower Allies build. Previous Empower Allies builds using Greatsword possessed slightly higher personal DPS, but lacked a significant amount of Vulnerability stacking potential. You were often in a situation where EA boosted your party DPS by 4%, but you lost 4 stacks of Vulnerability which results in breaking even. The Pure Axe Empowered Allies build provides the same team boosting capabilities of Empower Allies while also maximizing the amount of Vulnerability stacks possible. The next two builds, Pure Axe DPS and Pure Greatsword DPS are flawed in two different, but equally important ways. The Pure Axe build makes the highest Vulnerability stacks of any Warrior build, but it’s personal DPS is so low that even the Vulnerability Adjusted DPS makes it suboptimal. The Pure Greatsword build, on the other hand, has the greatest potential DPS of any warrior build under optimal conditions, however it has extremely weak Vulnerability stacking capability and when other builds’ DPS is adjusted for Vulnerability, the Pure GS comes up short. It does bear to mention, that in a party that can hit the Vulnerability cap easily (Engineer in party or some other means) a Pure GS build is capable of being optimal. The last build. Phalanx Strength, is an outlier. It sacrifices significant personal DPS for the ability to stack significant Might for the entire party. Previous iterations of this build use the Pure Greatsword DPS rotation, but the extremely weak Vulnerability stacking resulted in even worse DPS. The only reasonable way to play a non-detrimental PS build is to use Fast Hands with an Axe/Mace swap. This will sacrifice a small amount of Might stacking in order to provide reasonable Vulnerability production. This build is only truly acceptable for pick up groups with little coordination, and within that genre it is only acceptable for team comps that have severe Might deficiencies. Such a team comp would include no Elementalists, no Engineers, no other Warriors. The presence of any other Might generator makes the marginal value of a Phalanx Strength Warrior reduced significantly. In all the builds I will cover, the gear I recommend is Berserker with Scholar runes. The exception to the Scholars runes will be for the Phalanx build, which benefits greatly from Strength Runes. The recent nerf to Strength Runes makes them suboptimal for organized teams. Additionally, for many (if not all) builds there is some amount of Assassins gear that results in an absolutely optimal DPS production. However, what is optimal depends on which Food you use and whether or not you have a Ranger in your party. Since it is easier to change Food, and since Rangers come and go, I find it best to recommend full Berserker stats on all gear. The difference from most optimal Assassins mix to full Berserker is rarely ever greater than 1% and in many cases is less than one one-hundreth of a percent. This makes recommending Full Berserker easier, and it allows me to suggest optimal Foods for each build with confidence. As far as Fine Infusions go, in almost every case Precision infusions are superior. However, this can change depending on which food you use and whether or not a Ranger is in your party. My recommendation is to use Precise infusions; however, the difference between Precise and Mighty is relatively small and I would not recommend overwriting any existing Mighty infusions. Backup Greatsword and Axe with Sigil of Frailty for daytime dungeons where the Night sigil does not function. In Strength, we select Dual Wielding, Slashing Power and Berserker’s Power. In Arms we select Rending Strikes and Forceful Greatsword. In Discipline we take Signet Mastery. In areas where you prefer Battle Standard, replace Signet Mastery with Warrior’s Sprint. The goal of this build is to maximize personal DPS by utilizing the Greatsword burst skills on cool down, while using Fast Hands to swap to Axe/Mace and gain access to the superior Vulnerability stacking capabilities of that set. While this build has slightly lower maximum potential than Pure Greatsword and slightly lower Vulnerability stacking abilities to Pure Axe, it is good enough at each to be more optimal in the most situations to make it optimal. In Strength we take Dual Wielding and Axe Mastery. In Arms we select Deep Strikes, Rending Strikes, and Dual Wield Agility. In Tactics we take Empowered and Empower Allies. This trait spread produces similar DPS results to the Pure Greatsword variant of Empowered Allies, but produces an average of 4 more stacks of Vulnerability. When the extra 4 stacks are taken into consideration, it is significantly more powerful than the Greatsword version. In Arms, we take Rending Strikes and Forceful Greatsword. In Tactics, we select Empowered, Empower Allies, and Phalanx Strength. In Discipline we use Signet Mastery. This trait selection produces slightly less DPS than the 0/6/0/6/2 variation, but it produces approximately 4 additional stacks of Vulnerability which make it the superior build in almost every conceivable context. 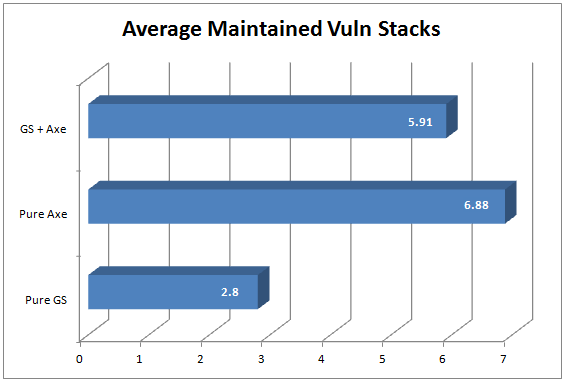 As a full support build, sacrificing many Vulnerability stacks to slightly buff Might makes less sense than slightly reducing Might to significantly buffing Vulnerability. For casual dungeons or fractals, I still recommend Omnomberry Pies/Ghosts/Candied Dragon Rolls. These are very good against bosses with conditions or Retaliation, and especially when you use Scholar Runes and preserving your hit points is of importance. I also find these very useful in Fractals where the splash damage from trash mobs make taking some damage inevitable and it is highly beneficial to utilize the extra healing. For times where there is no dungeon potion worth bringing, you can use Skale Venom. Weakness is useful in Fractals for minimizing some of the difficult to avoid damage from the trash mobs in various fractal shards. As always, have the full compliment of Slayer Potions in order to always have the maximum damage boosts and damage reduction. Please refer to the video guide for example DPS rotations. When solo’ing content, you should try to remain on your Greatsword as much as is possible. There are certain bosses where you do need the block provided by Sword offhand in order to melee optimally. For these fights I recommend having your Axe/Sword set on swap. Additionally, there are some encounters where the utility provided by Tremor on the Mace is extremely useful. For these encounters I encourage you to utilize the Axe traits as above and have Axe/Mace on swap. This will allow you to maximize your efficiency. For the times (or PUGs) where you need to range, Longbow is the preferred weapon over Rifle. Longbow has slightly lower DPS but has superior utility in regards to a fire field, a blast finisher and an immobilize skill, each of which are to the advantage of a creative player.